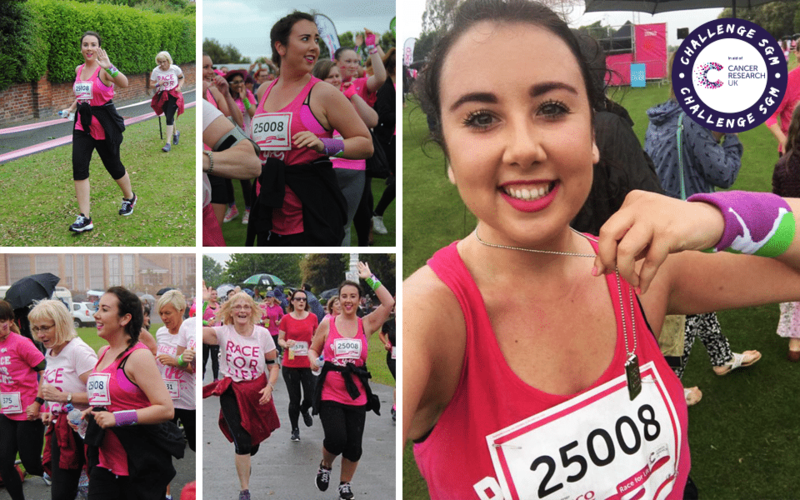 From the least athletic girl you could possibly meet, on Sunday I did something I had never done before I ran the 5k Folkestone Race For Life (non-stop, I may add) and have so far raised £105 out of my £100 target. Although I’m quite sure (unfortunately) that my time of 35.12 doesn’t rival that of Usain Bolt’s, I’m happy with it nonetheless. I’ve been training (on and off, but mainly on) for the past month and a half, and only ever managed 3.2k in the evenings, so knew I really had my work cut out for race day. I was a bit apprehensive to do the race alone, but as would luck would have it, I bumped into my Mum’s friend Jacqui an hour before the race so we both ran together. The infectious and positive atmosphere was uplifting and added a friendly sense of competition among the Pink Army: For, Hell hath no fury like a woman in pink! It was touching to see women taking part that were in the process of receiving chemotherapy, and that to me showed a sense of utter selflessness; I was adamant to run the whole race without stopping and giving up, because in life you need to have the same attitude no matter what comes your way, so I did. I was greeted with a cool dog tag silver medal at the finish line as well as a well-needed brioche and a mini deodorant (it’s true, pink stinks!). Sign up early: Places go fast! Plus, it gives you time to plan a training routine and get your body used to the distance. Keep going: Pace yourself – Jacqui gave me a handy tip in that dropping your shoulders and arms will help you run up hills / inclines more easily. The key is not to compare yourself to the other runners – comparison is the thief of joy, so if you know you’re doing extremely well in terms of yourself, that’s perfect and it doesn’t matter who keeps overtaking you. Give yourself a break: It takes a while to build up the ability to run the distance comfortably. You’re not going to have it down straight away (especially if you’ve never done it before), so take regular breaks. Leave your stuff at home: Only bring your essentials (unless you’re prepared to run with a backpack on). I normally run to music, but the rain meant I had to run unplugged and it was so much better! Have fun! These days are meant to be a fun way of raising money for charity, so get involved, get active, and get going! Would I do this again? 100%. It was such a good experience, and it felt good to be doing something so amazing for an amazing cause. You should definitely complete a race/run/jog/walk/plod for life at some point. If not for the experience, then for the chance to change someone’s life by raising money for charity. I’d also like to thank everyone who sponsored me. It made me that bit more committed to the cause and I couldn’t have done this without your support. Don’t forget you can still donate here!